You choose a package and get exactly what items you need. old airplane two tier or three tier diaper cake! When you checkout you must put in notes to seller the date you need your order by! Please put a date prior to your event date as your order will arrive on or before the date you enter! If you do not put a date your order will ship in 4-6 weeks. These can be customized specific to your needs. If you would like them in different colors please just let me know. 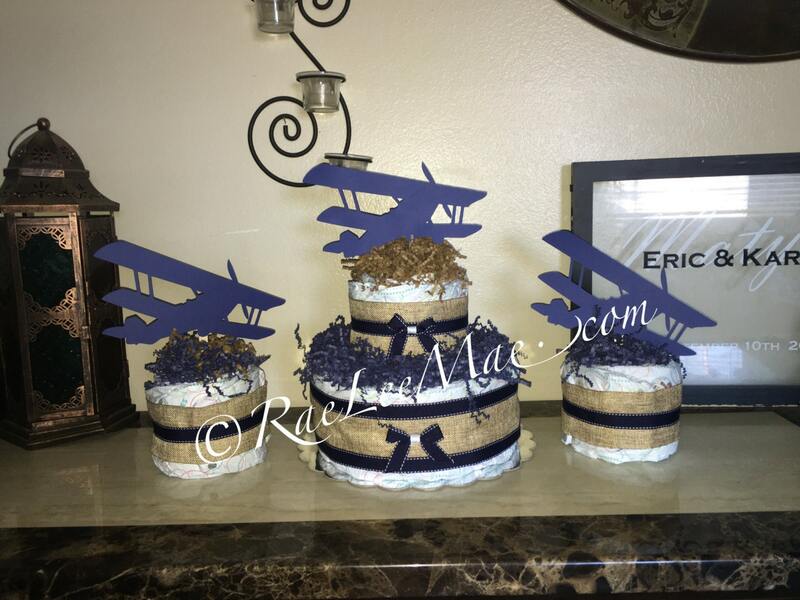 If you would like to order multiple two tier diaper cakes please message me for shipping quoted as I can combine shipping!!! diapercake minis are sold separately please message me for price! Matching banners, cupcake toppers, invitations, birthday Centerpieces, thank you tags, confetti are all available. Just message us for what you would like. This is a RaeLeeMae exclusive creation! Please do not copy or try to recreate! We take great pride in our creations and spend a lot of time coming up with new and unique designs. Additional shipping fees may apply to Alaska and Puerto Rico. Please message us prior to purchasing for a shipping quote. We will gladly ship anywhere in the world. If you would like us to ship outside of the United States please message us for a shipping quote. These were the perfect center pieces! Was a big hit. Thank you for for making sure we got them on time and for the special attention you gave them. Would recommend them over and over again! !